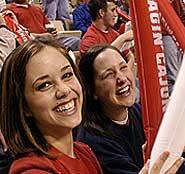 Four former Ragin’ Cajun athletes were inducted into the University of Louisiana at Lafayette Athletic Hall of Fame during Homecoming 2007. Inductees to the Ragin’ Cajuns Letterman’s Club included Walter J. Landry Jr., track and field; Tiffany Whittall Harris, softball; David Alvis, baseball; and Brian Mitchell, football. The purpose of the Hall of Fame is to give recognition to those athletes who have made a significant contribution to the good name of the university. They must demonstrate exceptional ability and sportsmanship on the playing fields, commendable scholarship in the classroom, and high quality leadership on campus. In addition, they have to establish a personal reputation for character and citizenship in the community in which they reside. Walter J. Landry Jr., was a four-year triple-jumper for the Ragin’ Cajuns Track and Field and Cross Country teams from 1994-1997. During his USL athletic career he captured the top honor all college athletes strive to achieve - All American. But, Landry did it four times as the NCAA triple jump champion each of his four years. He was also a key factor in the four Sun Belt Conference Team Championship titles won by the Ragin’ Cajuns from 1994-1997. Today, Landry resides in Georgia where he is a member of the Pleasant Hill Baptist Church and serves on the Transportation Ministry. Tiffany Whittall Harris is a 1995 USL graduate in Public Relations. Tiffany left a mark during her four year career at USL, on the field and in the record books including helping to lead the Lady Cajun Softball team to its first two World Series appearances in 1993 and 1995. An All-American catcher, Tiffany was a four-year letterman for the Lady Cajuns and still holds several NCAA and UL Lafayette records. During her years as a Lady Cajun the team was nationally ranked 12th in 1992, 8th in 1993, 2nd in 1994, and 5th in 1995. Harris’ honors include: All-American, All-Region, team captain, NCAA and UL Lafayette record holder for RBI in a game at 11, NCAA and UL Lafayette record holder for total bases in a game at 13 (including 2 grand slams in the same inning), All-time highest fielding percentage for a career at .994 ( as well as in a season at .998) and 3rd in both career chances at 1,474 and putouts at 1,389. She was also a gold medal winner at the 1995 Olympic Festival. Harris, who resides in Lafayette, continues to serve the university and her community as a member of the UL Lafayette Athletic Advisory Foundation, Past President of the Ragin’ Cajuns Lettermen Club, member of the Lafayette Optimist Club, member of the Business Marketing Association, and a member of Our Lady of Fatima Church. She is married to Robert Harris (1983 Alum), has one son, Logan, and is Executive Vice President of Foster Marketing Communications. David Alvis was a four-year infielder for the Ragin’ Cajun Baseball team from 1982-1985 - under the helm of Mel Didier. Alvis set numerous records while at USL, many of which still stand today. In the 1984 season as team captain, he led the team in batting average with .364, in hits with 71, in doubles with 11, with runs scored with 45 , and was asked to play on the USA Baseball World Cup Team - where they took the bronze medal. Then, again as team captain during the 1985 season, Alvis led the team in stolen bases with 10, in RBI with 54, set a single season home run record with 19 (which still stands today), and went on to make the All-Louisiana team. Today, he ranks 4th all-time at UL Lafayette in career home runs with 33, 4th in RBI with 167, 6th in total bases with 157, and 2nd all-time putouts as a first baseman. Following his collegiate career, Alvis went on to play professional baseball in the Cleveland Indian organization after originally being drafted by the Texas Rangers. He now resides in Jasper, Texas, with his wife, Rachel, and their children Will, Jessica, and Sam. Alvis is a national Accounts Manager for Temple-Inland Forrest Products. Brian Mitchell was an outstanding four-year performer for the Cajun football team from 1986-1989. His list of accomplishments during his career at USL is amazing. Brian was a first-team All-Louisiana selection in 1988 and 1989 as well as being named the 1989 Offensive Player of the Year. He was the first player in NCAA history to pass for more than 5,000 (5,447) yards and rush for more than 3,000 (3,335). Mitchell still holds the NCAA record for most touchdowns scored by a quarterback at 47. Following his stellar Cajun career, Brian went on to make history in the NFL, playing the majority of his career with the Washington Redskins and then moving to the Philadelphia Eagles, and the New York Giants before retiring in 2003 - after only missing 1 game in 13 years and setting 13 NFL records. Some of these records include all-time leader in total yards (23,330), kickoff return yards (14,014), punt return yards (4,999), special team touchdowns (13), punt return touchdowns (9), and longest kickoff return for a touchdown (100 yards). Mitchell was a member of the Super Bowl XXVI Champions and a 1995 Pro Bowl selection. Just this year, he was inducted into the Louisiana Sports Hall of Fame. Today, Mitchell works for Clear Channel Radio as a sports co-host and serves on numerous organizations like Stuller Place, Ronald McDonald House, Walk Against Hunger, Acadiana Outreach Center, and his own Brian Mitchell Foundation. He resides in Centerville, Virginia with his wife, Monica, and their three daughters - Bria, Maya, and Alia. Brian also has one son - Willie.